Autumn is a beautiful time of year to enjoy the great outdoors as temperature cool and the leaves begin to fall. However those colorful leaves can cause serious problems for your home if you don’t carefully clean and maintain your gutters. Roof damage can occur when water backs up and can be particularly problematic as snow and ice come into the picture. This can lead to costly roof repairs or replacement. The roof of your home represents a large area that collects rain. Anything that falls on it needs to be collected and carried away. Gutters and downspouts are the transport system. When they are functioning correctly, Water that falls on the roof, flows through the gutters off the roof and into the ground. However, debris in gutters can clog that flow and cause gutters to stop working and since the inside of your gutters are not easily seen, those obstructions can often go unnoticed. It’s therefore very important to develop a strategy to keep them functional and unobstructed. At the simplest level, keeping a maintenance calendar for you your home will ensure that you take care of low interval care like gutter cleaning and inspection at least once a year. With all of the smartphone apps and utilities available, setting up a calendar is not a huge chore. Also since the most critical time of year to check your gutters is after the autumn leaves have all fallen, you may be able to do it while decorating your home for Halloween or Christmas. Regardless of how you remind yourself, you will need to get a ladder out and carefully inspect your gutters and downspouts. First and foremost, be safe! Clean debris and look for signs of leaks. Make sure gutters aren’t sagging and trapping water and tighten any gutter hangers or downspout brackets that are loose. Finally, replace any worn or damaged components. Reverse Curve Guards – These are typically made from metal or vinyl and sit over the gutter opening. They essentially form a cover that allows water to slip around the guard but prevents large debris from coming to rest in the gutter. The major drawback with these is they do not handle heavy rain very well. High volumes of water will simply overshoot the gutter and fall to the ground below. Slit Gutter Covers – These are a variant of the reverse-curve and usually include one or two recessed slots that increase the amount of rainwater that can flow into the gutter. These systems also struggle to manage heavy downpours like the simple recurve system. Sponge Guards – This approach places a sponge that is shaped to conform to th inside of your gutter. Water flows through and since the mass of the sponge fills the gutter space, large debris cannot accumulate. The real downside is that small debris particularly seeds can can get caught in the sponge and sprout. Metal Screens – These curved screens come in short sections and fasten onto the outer lip of the gutter. They are inexpensive and easy to install but are susceptible to clogging because the opening size in the mesh catches small debris. 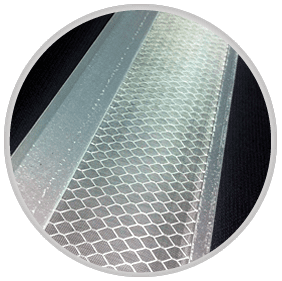 Micro Mesh Gutter Guards – Micro mesh guards consist of a support frame and a filtering mesh material which ranges from fine to micro mesh. The advantage of micro mesh technology is that they provide the best flow through characteristics and do not clog with small debris. While their performance is superior the only real drawback is that the systems are more complicated to install. Remember all homes will face different challenges based on the type and slope of the roof as well as the environment around the home. Some homes will never see a leaf in their gutter. Others will face an onslaught of debris as a constant challenge. Once you have a good understanding of your particular situation and the products available to help, you can make the right choice for your home. On a local note, if you live in the Northern Va area, DryHome offers gutter guard installation as well as an array of other home services. Follow this link for more information on gutter guard installation in Northern Va.